Have you started any of your Christmas shopping yet? I have purchased a few gifts and took the time this week to get them wrapped. 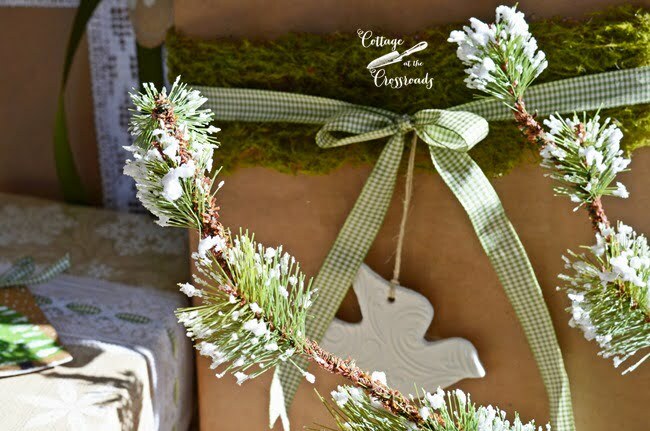 So I thought I’d share some of my pretty and easy gift wrap ideas with you. This year I’m using a green and natural color scheme in my Christmas decorating. I’m calling it my Green Peaceful Pine Cone Theme. Ok, I know that’s not a good theme title right now, but you can get an idea of the direction I’m heading. I think it looks so much prettier when the wrapping paper is coordinated under the tree, so I’m using brown kraft paper along with another natural colored paper, but I have yet to find a green wrapping paper design that I like. 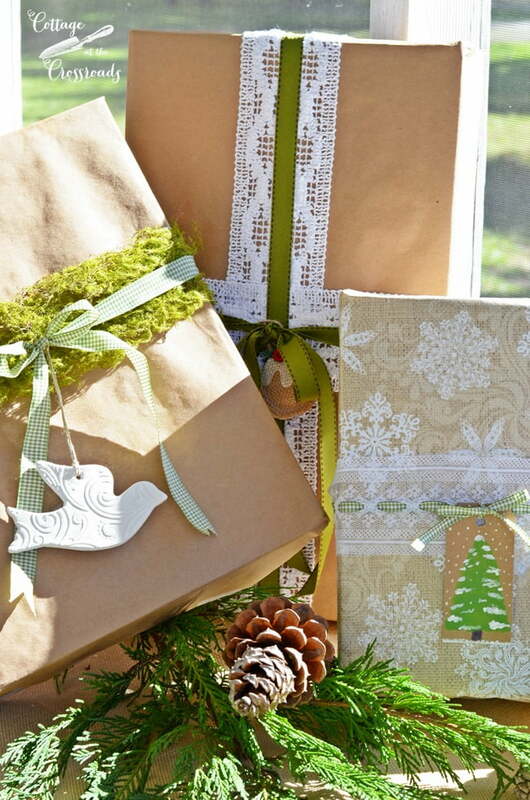 Buying and coordinating your wrapping paper in advance helps to make the pretty packages part of the decorations. Years ago, my first real job was in Belk’s Department Store. I was placed in the china and housewares department where I was taught to wrap wedding gifts. I’ll never forget the manager, Mr. Howard, teaching me to pull the wrapping paper tight and to crease the edges. Taking a little bit of time to do that makes the package so much neater. I’ll never forget Mr. Howard watching me wrap my first gift and how he corrected my tape placement! I think I was just putting it anywhere, but he showed me that it should be placed along the folded edge. To this day, if I get a little careless, I can still hear his voice admonishing me, but I’m awfully glad he gave me some good training. 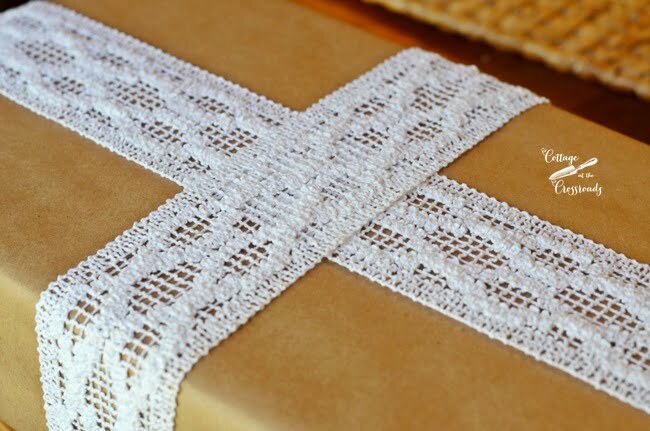 I love wrapping gifts and making them special by using some unexpected materials and embellishments. On one of my packages, I used this ribbon that looks like moss. I’ve had it for over two years since I found it in a clearance bin. It fits in great with my natural theme that I’m using this year. 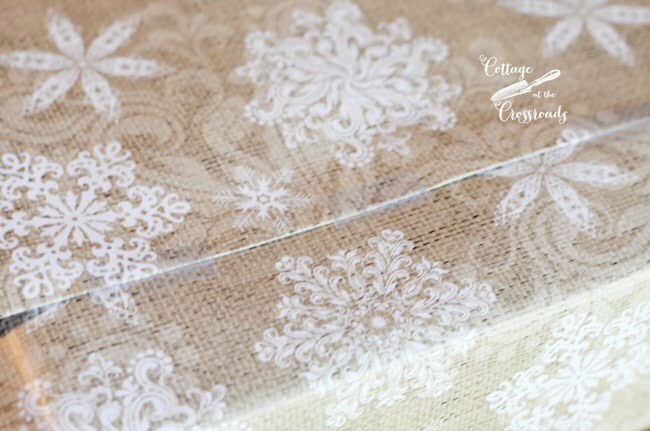 And while I was digging around in my stash of ribbons and trims, I found this delicate piece that seemed to go with one of my wrapping papers. 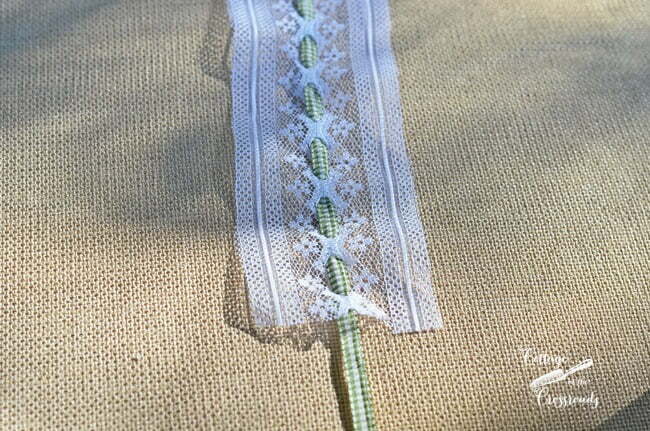 I threaded it with some gingham ribbon that I had on hand. And I found this lovely trim that I put on one of my packages. So don’t be afraid to show a little of your personality or what you love when wrapping gifts. Or even better, match your package with things that you know your recipient loves. 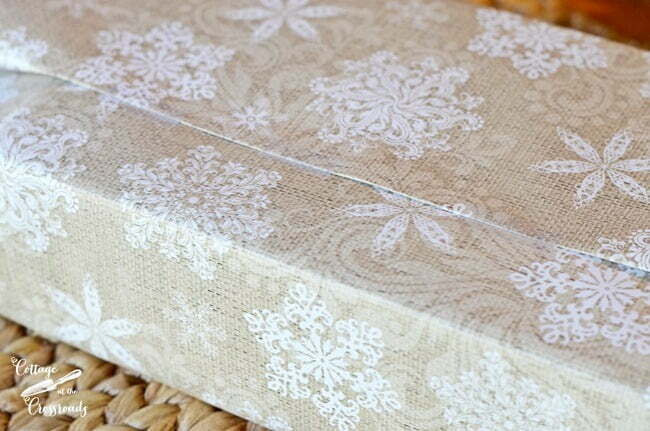 Keeping a stash of ribbons, tags, and baubles makes it easier to personalize your package. 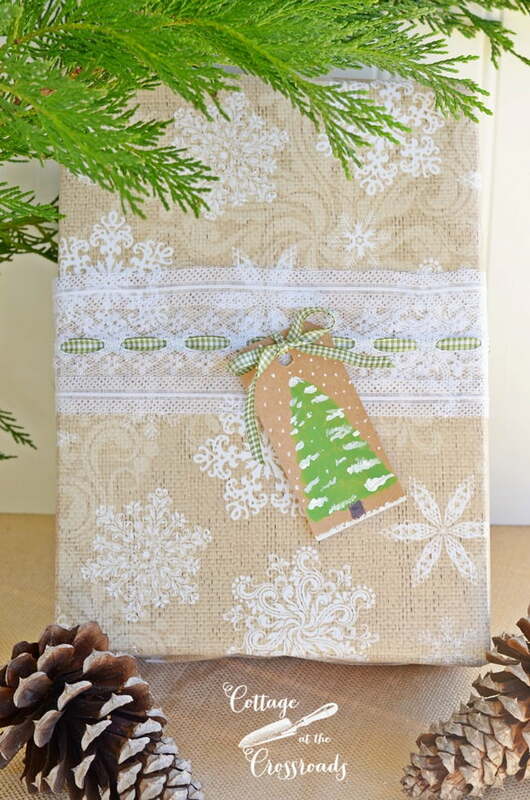 The little burlap tag, found at Hobby Lobby, makes a pretty adornment for this package. 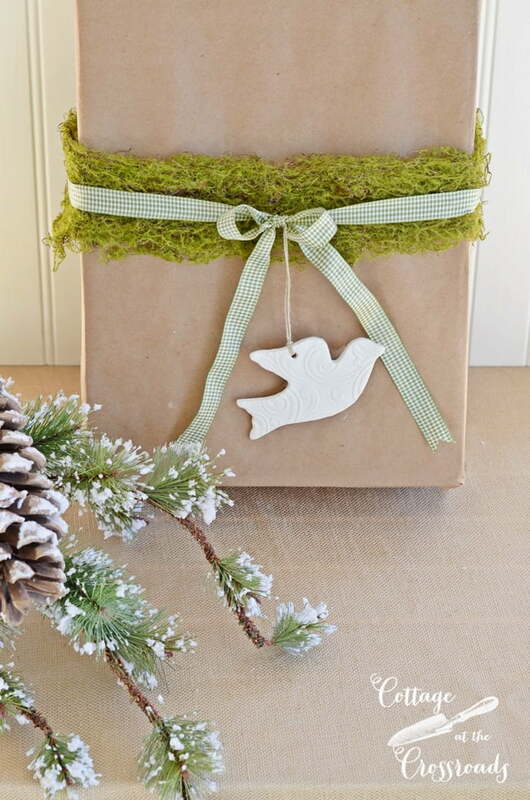 I just adore this peaceful clay dove tag on this package. I ordered a set of these when my friend Ann made them available several months ago. She is currently filling pre-orders for them now and will have an updated list of the ones available later this week HERE. 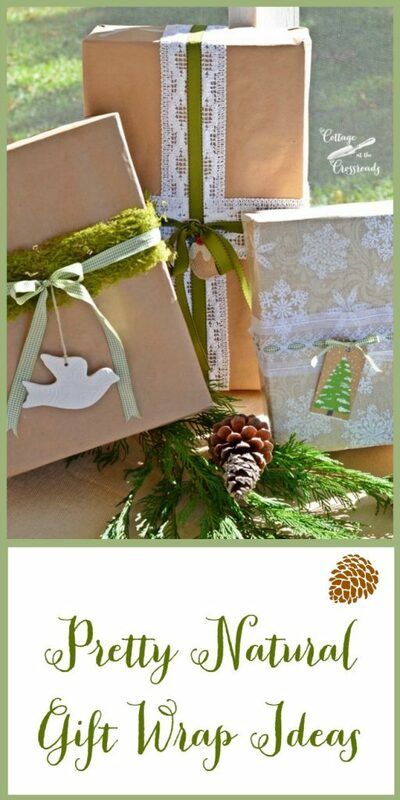 A great way to get your children involved in the gift wrapping is to have them paint some gift tags. It took me about 5 minutes to paint this little tree, and I just used one that I found online as a model. Just be sure to buy the heavier plain tags so that they don’t curl when painted! If you wrap a few gifts at a time, the job is much more pleasurable! Make it easier on yourself by putting all your wrapping paper and supplies in a handy location so that you can wrap as you go along. I keep all of my supplies including scissors and tape in a big, long box under the guest bed. I hope that you have found these tips helpful. A gift wrapped with love and care is sure to be appreciated. 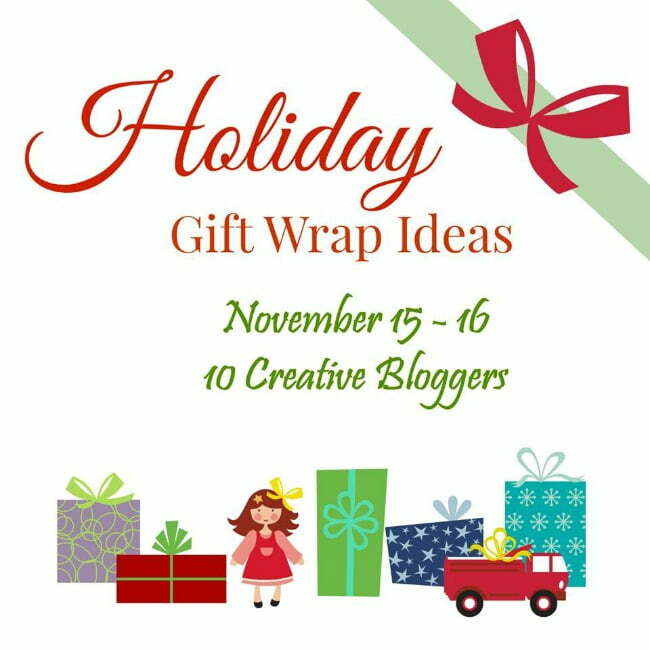 Today and tomorrow I’m partying with some of my favorite bloggers who are sharing their gift wrap ideas, too. 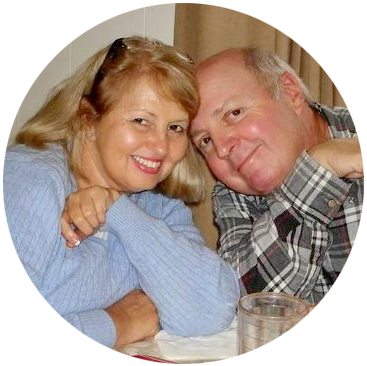 The tour is being hosted by the fabulously creative Kathy from Petticoat Junktion. 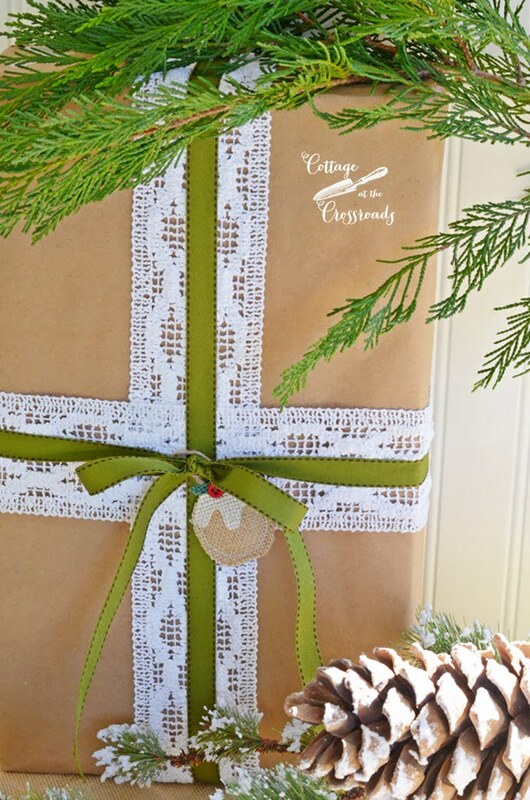 Click on any of the links below to see more pretty packages almost too pretty to open! « The Wettest Fall Ever! I love your natural and green theme Jane, it looks like it would be perfectly at home in the potting shed 🙂 The moss ribbon is perfect, I need to see if I can find some at Hobby Lobby! I am so impressed you started wrapping already! I have done some shopping, I hit the Lenox Outlet last week when they had 25 off the whole store. I could wrap all that I bought, just not into it yet! Hope all is well there, Jane! I love the natural look Jane. Pinning! Jane, the presents are so pretty. The presentation looks professional and I love the green with brown khaki. Great job and thank you for sharing your talent. 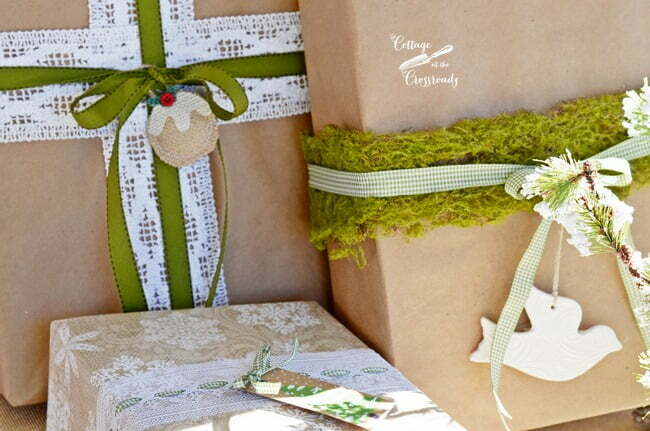 love the moss ribbon with the brown paper Jane! Soooo pretty Jane. The gift wrap is beautiful. The special people getting these gifts will not want to open them with them being so pretty! Have a great new week ahead. Absolutely gorgeous. I live in Greenwood SC so come on over and wrap mine. Lol. Simply Beautiful! Picture Perfect Packages! One prettier than the next!!! Hugs! I adore this color palette! The moss is just s beautiful addition. I also think craft paper is the way to go. Such great tips, thanks for sharing! Gorgeous, Jane and you are way ahead of me. So very pretty and creative Jane!…Just love the natural look and love the addition of Ann’s clay tag. Thanks for the inspiration. So love your beautifully wrapped gifts!!! These have to be some of the prettiest presents I’ve ever seen! Good Morning Jane! I always loved watching the ladies wrap presents at the department stores. Wrapping gifts is a true art. 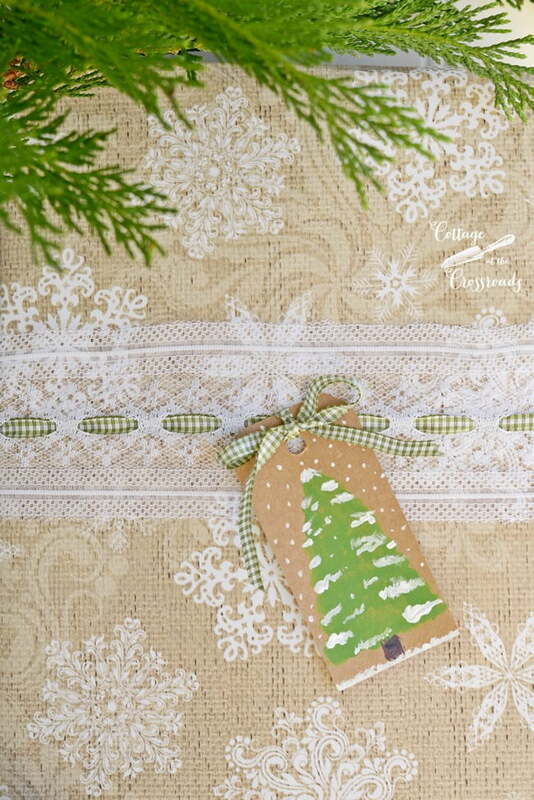 I love the green “moss” ribbon, the gingham ribbon, the tree tag, everything I guess, lol. Have a great day! So pretty, Jane. Love your ideas! Jane – we love your color scheme and theme. Our tastes are so similar! 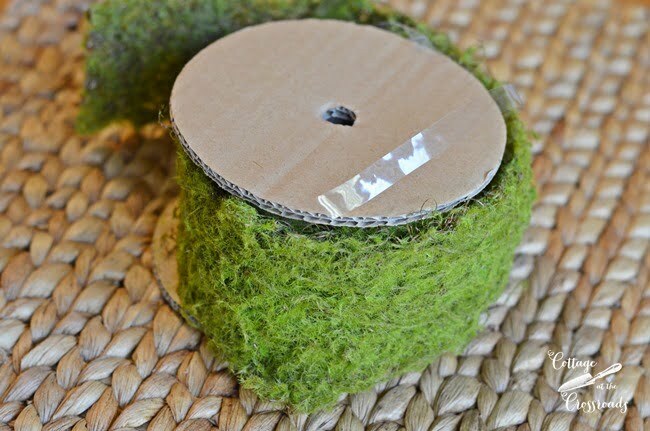 We have never seen moss ribbon before but are now obsessed with yours! Your packaging and tips are wonderful. Thanks for sharing! Oh Jane, these are all so pretty! I love the color coordinated packages and the unique ribbons and tags you used.